Here is a bit of context behind what inspired me to deliver this workshop. I was tutoring a friend’s daughter in the summer holidays (2016) before she started learning AS Mathematics after achieving a A in her maths GCSE. My friend’s daughter is intelligent, enjoys studying mathematics and is able to learn new concepts very quickly but she struggled to make the correct decisions to complete each sub-procedure in long calculations. She would struggle to multiply an integer and a fraction, because she didn’t know what decision to make i.e. write the integer as a fraction over one. So I spent a lot of time creating questions within drills and deliberate practice exercises for her to gain the procedural knowledge to a degree of fluency where she wasn’t struggling to complete different sub-procedures. I am going to look at one high level procedures that I mentioned in my workshop; multiplying fractions. Multiplying decimals (that can be converted into fractions) and fractions. When teaching my tutee index notation she struggled to attempt the following problem because she wasn’t able to identify how to multiply an integer with a fraction. I told her explicitly how to multiply 2 and a third quickly, because that is what I do, and all pupils do this if and when they spot the pattern (but not applicable when the numerator of the fraction is not 1). Later on in another session, my tutee struggled with the following question because she didn’t realise that a fraction can be written as the product of an integer (numerator of the fraction – 2) and a fraction (unit fraction with the same denominator – 1/3 ) e.g. 2/3 equals to the product of 2 and 1/3. And again, when a question gets more complex like the one below because the base number is a mixed number, rewriting 5/2 as a product of 5 and ½ is a necessary step to evaluate the question. However, what the take-away here is is that multiplying fractions is a high leverage procedure. A part of the procedure is to rewrite a fraction as a product of an integer and a fractions. So how can pupils learn this to successfully automatise their procedural knowledge of multiplying fractions? This can be achieved through an understanding of multiple representations of the following possible problem types that arise when evaluating the base number/term held to a power which is a fraction. 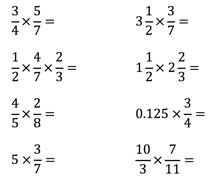 The emphasis of exploring different problem types available within the topic of multiplying fractions, and recognising that a fraction is a product of an integer (numerator of the fraction) and a fraction (unit fraction using the same denominator), and then seeing the multiple representations of this enables a level of proficiency to allow successful learning of new content. My tutee wasn’t really learning how to simplify indices because she was focusing on learning how to complete each sub-procedure. I think this proficiency needs to be achieved in KS3. In my next post, I shall give another example – halving! Deciding the first step is a type of question where pupils are only asked to decide explicitly which step to perform. A pupil reviews the problem type and identifies what steps he/she needs to take. After acquiring knowledge of a particular step then automatically the end of each step triggers the start of the next one. I will be looking at some questions which test whether pupils can decide on the correct step to perform, and compare them to more commonly asked questions which make the decisions for pupils. What is 4 times 2? What two numbers do I multiply first? The correct answer to all the above questions are the same. However, the first question being asked makes the decision for the pupil because they are told that they are to multiply, and which numbers to multiply. The second question is testing whether the pupils know that we multiply the numerators, and then multiply the denominators, but the decision is being made for the pupils. It is possible that a pupil will give a wrong answer by stating two numbers that we do not multiply (4 x 11). The final question is specifically asking a question to test if a pupil knows what step to perform, compared to the first two question. What do I cross-simplify first? Again, the first question makes the decision for the pupils compared to the second question. The second question is testing if a pupil can recall the first step in answering this question. This problem type is different from the one above because you can cross simplify. And I would consider cross-simplifying the first step to the procedure but simplifying the product of both fractions can happen after a pupil has multiplied the two fractions. What is the first fraction as an improper fraction? Again, the first question makes the decision for the pupils. Furthermore, the first step of the previous two problem types cannot be applied here because there is a necessary step before both fractions can be multiplied. 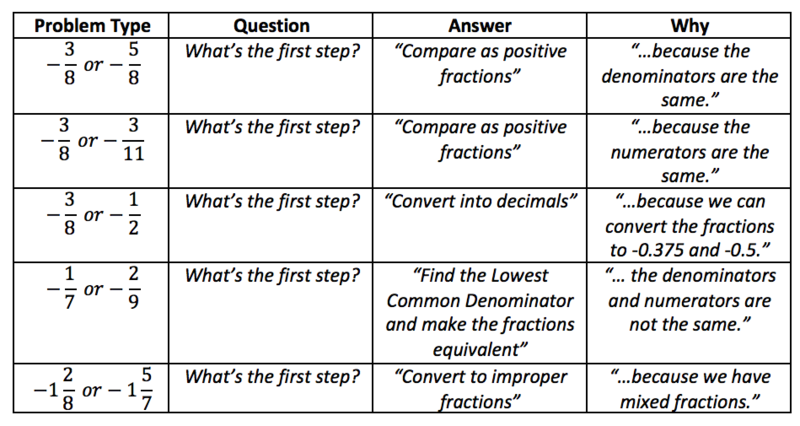 The following question – “What is the first step?” not only helps pupils to learn explicitly which step to perform first but it also allows pupils to distinguish between different problem types. This is because a pupil is then attaching their knowledge of what decision to take depending on the make-up of the question. They are acquiring surface knowledge of the problem type – If I see mixed numbers when I am multiplying fractions then I must convert them to Improper fractions first. This form of questioning allows pupils to develop mathematical reasoning around different procedural calculations. For example, a pupil recognises that to multiply mixed numbers we must convert them into improper fractions because we cannot multiply 1 with 1 and 4/5 with 2/11 because 1 and 4/5 is not 1 x 4/5 but 1 + 4/5 which equals to 9/5. This also consolidates pupils existing knowledge of mixed numbers and their equivalent forms as improper fractions. Even though the problems may look the same to pupils, through teaching pupils explicit decision making around the problem types the pupils are doing two things. They are identifying the first step they need to take, and they are attaching their knowledge of the first step by identifying the features of each problem type. For the most competent pupils their mathematical reasoning will make the features of each problem type and the first step they need to take seem obvious. For pupils who’s mathematical understanding isn’t as fluid they greatly benefit from being asked such questions, because they are identifying the features of each problem type which makes them different from each other, and thereby helping them know what is the first step they need to take.